The Lady Loves a Scandal by Christina McKnight is the story of Lady Sybil and Gideon Lyndon who love each other but get separated because of a deadly secret. The cover is beautiful and naughty giving the first impression of a racy regency romance but that isn't the case. The blurb is intriguing and add Christina McKnight's name to this mix and readers will stop to check this book! I enjoy Christina's writing. She writes well crafted stories with wholesome romances, admirable world building, often times suspense or mystery that keep the readers guessing till the end and characters that become dear to us. I got to know about her a year back and after getting one taste of her writing, I have voraciously devoured her books which I can attest to with the ever increasing list of reviews I still have to write! I thoroughly enjoyed each scene in this sweet romantic novella with its well developed characters, an engaging mystery that kept me on my toes and a wholesome, clean romance that tugged at my heartstrings and had me rooting for a happily-ever-after for the protagonists. 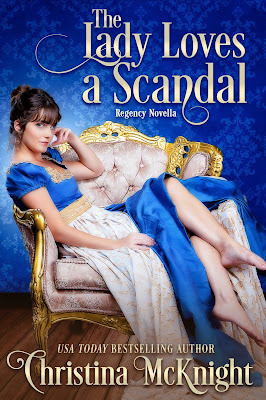 All in all, The Lady Loves a Scandal by Christina McKnight is a breezy, feel good historical suspense romance novella that is perfect to chill out in this blistering summer heat with a cool drink by your side. Njkinny recommends it to everyone and gives it 4.5 super shiny stars out of 5.